Click here: I-Square home page for the latest information. With the weather finally breaking, cement has been poured for flooring in BLDG #1… Some cosmetic work has started on the exterior and the office / art gallery has had 2 new showings. In addition, I-Square has recently helped with a girl scout fundraiser and a community bike collection is in process for those in need. I expect we will be seeing some new landscaping and continued construction shortly. The Irondequoit Town Board passed a tax agreement for the I-Square project in Irondequoit at a meeting Tuesday night. The agreement includes a PILOT, or Payment In Lieu of Taxes for 25 years. I-Square would bring new shops, restaurants and community space to the town. The proposed location for the project is at Titus Avenue and Cooper Road. Tuesday night's overwhelming approval for the PILOT agreement is a complete turn around from six months ago. Even a month ago the board chose to postpone a vote. Back in September Irondequoit Town Supervisor Mary Joyce D'Aurizio told News10NBC a 25-year PILOT was too long. D'Aurizio also said the financials didn't add up, but most importantly, she said "taxpayer after taxpayer have told the board not to approve a PILOT." News10NBC wanted to know what changed and why the board was holding up the vote when it chose to approve the tax agreement Tuesday night. "You have the Facebook fans who are very supportive of this, but we also have all these residents who come to us and disagree with the 25-year PILOT. We have to achieve a balance and weigh all of the residents who say 'we don't think this is good for the town' or 'we think this is good for the town.' So, we have to achieve a balance, so we were listening to all the residents, not just those who supported the PILOT, but also those who are very much against it," said D'Aurizio. Irondequoit native Mike Nolan and his wife Wendy have been working on I-Square for almost two years. 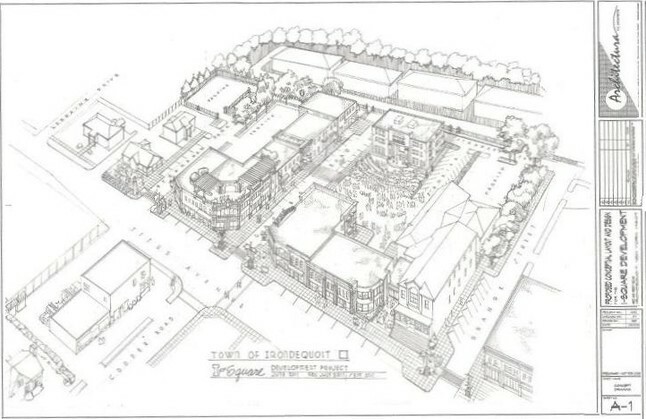 The development promises to bring in a mix of shops and restaurants, creating a town square for Irondequoit. Nolan says it has been a frustrating ordeal. Talks had broken down between Nolan and the town after the board postponed voting on the PILOT agreement last month. He says intervention by State Assembly Majority Leader Joe Morelle got things back on track. "That's our 13th meeting my mother pointed out to me that we've sat through and gone through and so I didn't really know what to expect. We're very happy it's off the ground. We're moving forward full speed, that's the most important thing. It's a great day for Irondequoit," said Nolan. He says the PILOT agreement should be signed, sealed and delivered on March 19 and construction will begin the following day. Back in 2011 we included on our website a new vision for our beloved town of Irondequoit called I-Square. Mike and Wendy Nolan, the project creators, have had many ups and downs trying to get this project moving forward. Unfortunately, at yet again another special town board meeting on January 23rd the approval for the project once again has been delayed. For all those who thought creating an Irondequoit town center in the Cooper-Titus-Hudson area was a pipe dream: Meet Mike and Wendy Nolan. Mike Nolan was raised in Irondequoit, next to West Irondequoit’s Seneca School, and stresses that he’s not a developer, but he has formed a company, I-Square, LLC, to develop and operate a family-friendly Irondequoit Town Center on the south side of Titus Avenue between Stranahan Park and Grange Place. He and his wife are determined to remedy the situation. Nolan already owns all of the properties from Union Park east, and just this week has rolled out the plan he and Wendy, a Fort Lauderdale, Fla. transplant, envision. He also owns some other properties in the area, including the “Irondequoit Hots” building, and is negotiating to purchase more. Before anyone gets worried, he plans to develop his plan and retain all existing businesses at the same time. Realtor Steve Walther knew Nolan as a child. He lived next door. “This is about a young man up who grew up in Irondequoit and who is staying and investing in Irondequoit,” Walther said. “I wish there were more people out there like that.” “I think he has the capability of pulling this (town center plan) together,” Walther added. Nolan purchased the family business in 2000, and said it has grown to 10 times its size in the past 10 years. SPEX makes automotive, appliance, Navy and electrical parts. “It’s American manufacturing right to its core … and it’s right here in Rochester,” said Nolan, who formerly worked as general manager of the Bob Johnson Chevrolet auto group for nine years. He said the genesis of his plans for Irondequoit started when a drugstore was proposed a few years ago in the same block he now owns. Most of the small businesses there would have been pushed out. He and his wife were building their new home, off Kings Highway North, at the same time, Nolan said, and the thought of that project didn’t sit well. “Our number 1 and 2 reasons for doing this are to retain the businesses that are here and to create a town center,” Nolan said. As a youngster, he remembers the area having an arcade and comic book store. “We’re starting new,” Nolan said. The grassroots citizens group HIPP — Helping Irondequoit Plan for Progress — is already on board. Nolan’s proposal starts with an extension of Cooper Road through the center of the project. There are not yet any municipal approvals for that aspect of the project. Once the road is in, construction would begin facing the extension. Once that new strip is completed, the businesses now facing Titus between Stranahan and Union parks would be relocated and their current buildings would be demolished and rebuilt. The Nolans’ vision — Mike estimates that it it will cost $10 to $12 million — follows the “mixed use” design guidelines included in a plan, and championed by the HIPP group and others, that was developed by the town several years ago. “Everything will be high-end and built to last; it will be built to look like a town center should,” Nolan said. He and Wendy envision an area that is conducive to walking — on 10 to 12-foot sidewalks — and gathering. “We want it to be a place people come and stay and shop and eat,” Wendy said. They also expect the project could over double the number of retail business spaces in the area. At the back of the project would be a four-story apartment building chosen, Mike explains, to add depth to the area. In front of the apartment building would be an outdoor stage and gathering area. At the southeast corner of the new Cooper-Titus intersection, the Nolans envision a high-end restaurant, perhaps with a rooftop wine bar, anchoring the spot. “We’re looking for an operator for that,” Mike said with a smile. They’re also hoping for “lots of stuff for kids,” starting with an ice cream parlor. He wants everything to be available at a reasonable cost. “If it all ends up being expensive, that drives people away,” Nolan said. Of course “making money” is on their “top 10” list for the project, “but it’s fifth on the list,” Nolan said.